I've not had such a successful week with recipes this week. Today's semi disaster was one of my own making so please do try the recipe if I ever get round to posting it. I've read many of Dan Lepard's recipes online and although I've only tried one of his recipes before, it worked really well so he's up there in my list of favourite cooks. I bought his latest book - Short and Sweet - after seeing people raving about it on Twitter. Amazon are currently selling it for just £8.99 - RRP is £25 - so I 'treated' myself, even though I'm meant to be making the most of my existing piles of books. It really is a feast for the greedy baker. The recipes are short and sweet and prefixed by stories about where the recipe came from, explanations about the science behind the bake or tips on how to achieve perfection. I can't wait to try out lots of recipes. The plan is to make banana fudge cookies with Miss A over the weekend. And then I found his chocolate marble crumble cake.... Need to find a really good reason to make this!! Still it's my birthday soon so I will have a huge bake in two weekend's time - no bags of cheap Tesco doughnuts for me! Anyway, back to the macarons. I've wanted to try making these for ages. Everyone bangs on about how difficult they are and yet, how wonderful they are. They're one of those things that set you apart from the rest of the baking crowd. If you can make them, you've pretty much made it. I'm sure I remember watching Lisa Faulkner fail at this on 'Sleb MasterChef when she was in the semi-final in France so I am in good company at the moment. Dan's recipe made it look so simple. Some recipes for macarons are so long winded, I've nodded off or my mind has wandered by step 7 of 22. Maybe that's why Holly Bell from GBBO made such perfect macarons - she has the time and patience that I don't. There was no faffing around processing the ground almonds into a fine dust. And yet, my macaron mixture had a bit of a rustic feel to it so I wasn't convinced. I really wanted to add food colouring but as it was my first attempt and Dan made no mention of it, I followed the recipe to the letter. Rustic macarons - not quite Laudree standard! Except the bit where it said to use BAKING paper. In my haste to get the bake done whilst the child was asleep and the husband was out, I picked up greaseproof instead - not realising my error until I'd piped my macarons. And despite all my pleading to the high priestess of baking, they stuck. The lovely Sadia (aka @bakingelements) gave me some top tips on how to fix it but sadly they were pretty much beyond redemption by this point. And to be honest, I was so underwhelmed by my first taste of macaron (even though it didn't have 'feet') that personally, I won't be in a hurry to make them again. It's just a glorified almond flavoured meringue. Or am I missing something? 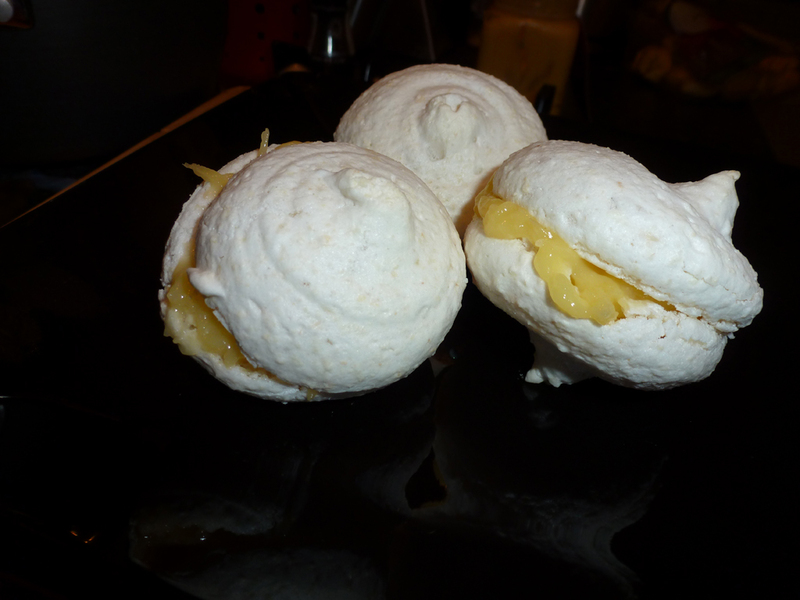 I'm not a meringue fan. I'd rather have something with a bit of substance - like cake. They look very pretty (mine didn't) - especially the Laudree ones (someone at work was given a box recently and they looked like precious jewels) but in all honesty, they're not for me. When I make them again, I will use Dan's recipe again as the failure was mine, not his recipe. Do buy the book, it's worth the money just for a good bedtime read, let alone the joy of actually baking from it. In fact, I think it's my new favourite book. Bring on the banana fudge cookies!